Seen a cheaper price Request a price match? 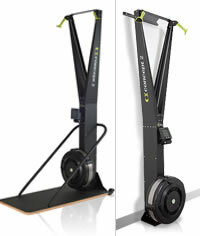 SKU: N/A Categories: Cross Fit, Cross Training, Rowers Tags: 2, Concept, Erg, Floor, PM5, Ski, SkiErg, Stand Brands: Concept 2. The Concept 2 SkiErg makes the sport of Nordic skiing available to everyone. Long recognised as delivering one of the toughest workouts around, Nordic skiing develops both strength and endurance and exercises the legs as well as the arms and core. 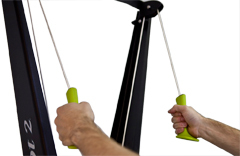 The SkiErg can be used for both double pole and classic alternating arm technique. The SkiErg uses the same flywheel resistance and electronic monitoring systems as our indoor rower, the proven choice of rowing athletes around the world since 1981, so you can rest assured that the machine is made to last. As well as being durable and well built, the SkiErg is sophisticated too, with an advanced monitor that provides immediate, accurate performance data. Whether you’re an elite cross-country skier looking to improve your poling power, a weekend enthusiast wanting to get into shape for the ski season, or just someone looking for a great workout, the SkiErg will help you achieve your goals. The Performance Monitor is what sets the Concept2 SkiErg apart from other cross-country training devices: sophisticated yet easy to use, it allows you to accurately assess your output, monitor your progress, and compare your scores with others. 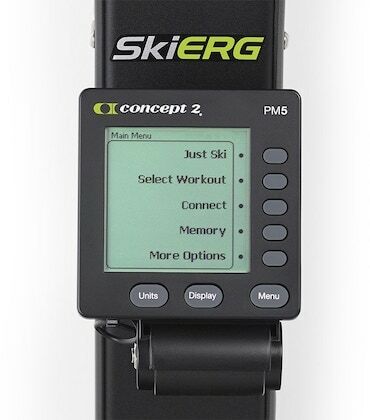 Each SkiErg comes with our most advanced Performance Monitor, the PM5. 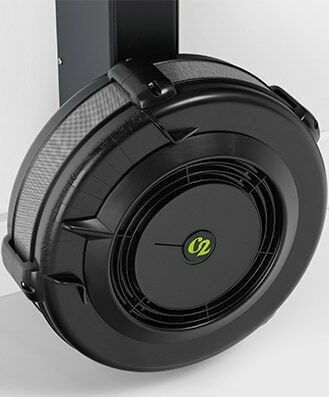 The SkiErg can be either mounted on a wall or used with a floor stand. Wall mounting provides the most compact option, while the floor stand, with its anti-skid deck and caster wheels, provides an all-in-one solution that makes the SkiErg mobile. Either way, the SkiErg is easy to assemble, and we provide all the tools you’ll need to do the job. The SkiErg relies on high-strength cords in its drive system. Much stronger than steel, the cords are also extremely lightweight, resulting in a system that is responsive and smooth. The SkiErg responds to your effort on every pull, so you are in full control of your exertion and resistance at all times. The spiral damper allows you to quickly adjust the airflow to the flywheel, so you can change the feel of the pull to suit your preference. Whether you want your workout to feel like you’re on flat terrain or an uphill climb, the SkiErg will respond to your needs. The SkiErg’s ergonomic, strapless handles provide for a comfortable, secure grip and won’t absorb sweat so they stay dry in high use settings. They are also suitable for all hand sizes as they require no adjustment. Our machines are well-known for their durability and construction. Tough and built to last, our machines withstand rigorous use in Nordic ski centers, living rooms, health clubs and military bases around the world. We make sure our machines are easy to care for so you can focus on using your investment, not maintaining it. The SkiErg requires very little assembly. There are a total of twelve screws, and we include all necessary tools and clear instructions with lots of pictures. Takes two D cell batteries. SkiErg provides operating power when machine is in use. For use with a PM5, PM4 or PM3, the Smartphone Cradle slides onto the top of the PM to provide a place to set your mobile device while using the indoor rower or SkiErg.